This blog is part one of a series of three blogs. Part two can be found here. 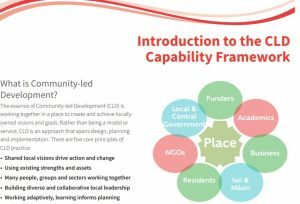 In this first blog, we’d like to talk about some of the theory behind Community-led Development (CLD) and about the resources we’ve created to help with both the theory and the practice of CLD. 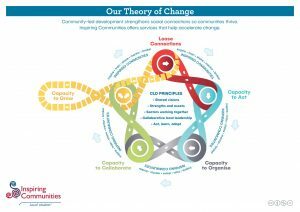 We have observed community-led change to be iterative and emergent – one thing leads to another, rather than being more formally underpinned by long-term plans and investment frameworks. As a result, locally-led change initiatives have tended to be smaller in scale, frequently succeeding in spite of government and agency systems, rather than because of them! We see the CLD Principles as fundamental in shaping the values, spirit, mind-set and approaches of change makers, no matter where they sit in the system. While at different times some principles may be more top of mind than others, collectively they remind us about what matters, helping guide our ‘why, what, with who and how’ in a practical, real-time way. Increasingly, we have noticed the CLD principles being picked up as a practice framework by organisations as well as communities. We think this reflects a growing desire (and need!) to work with local communities in more authentic and life-giving ways as both enablers and partners, going beyond the usual service provision roles. The principles have been refined several times over the last decade but the essence of our original thinking still remains. Recently, Inspiring Communities sought to better reflect Te Ao Māori in our way of working. We took advice from people we trusted, Māori and Pākehā who work and walk in both worlds, to get to this next stage. Knowing the reality of multiple ‘Māori world views’ and knowing CLD is all about harnessing multiple connections and connections to place – we opted to integrate a Te Ao Māori lens with our principles as a whole, rather than develop an additional Treaty/Māori specific principle. 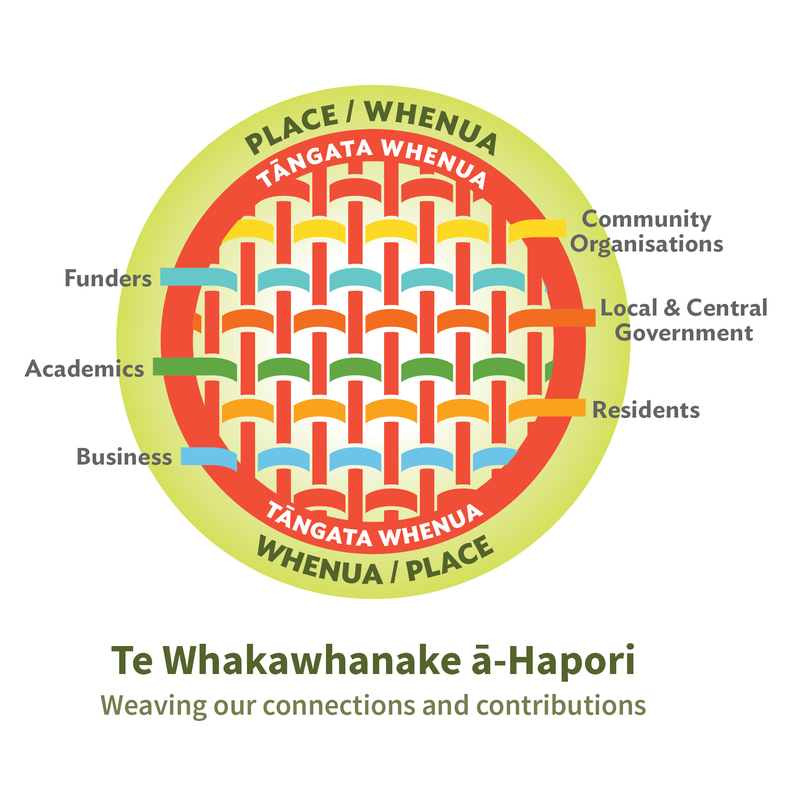 We realised that new language in Te Reo Māori was required to reflect what lies at the heart of a community-led development approach – an interweaving of relationships, contributions and connections. 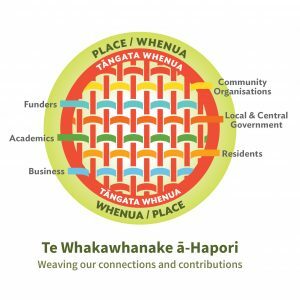 So we worked with a specialist linguist and reo speakers to create a new term for community-led development – Te whakawhanake ā-hapori. 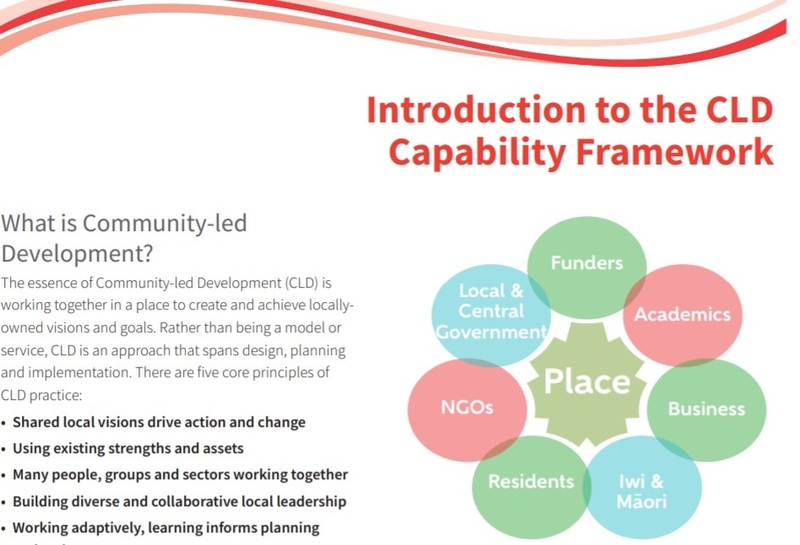 These CLD principles also sit at the heart of two other key frameworks Inspiring Communities has developed: Our Theory of Change and Our CLD Capability Framework. 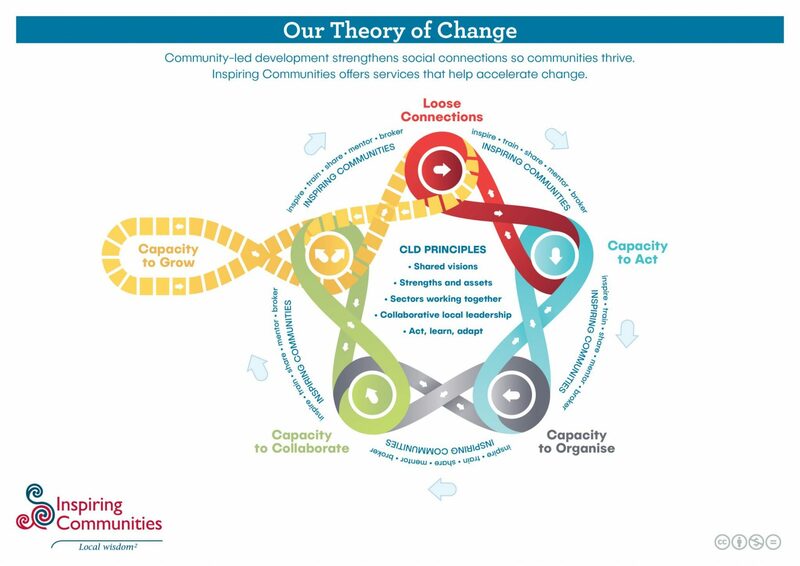 Our Theory of Change helps describe how community-led change happens. The starting point for our theory is that all communities have the ability to thrive. The relationships and trust between local people is vital to negotiating the complex challenges they face. People harness loose connections and help grow a capacity to act and, in doing so, form a shared vision. Using the CLD Principles increases citizens’ ability to realise the potential of their community. They begin to make plans and take action around the emerging vision. This cumulative process tends to evolve from a focus on organising to a capacity to collaborate. The ability to engage with groups who have different views and approaches is critical. Guiding the transition between these phases are the disciplines of measurement, reflection, learning and adaptation. The process isn’t usually linear; there are ebbs and flows with related joys and frustrations. It takes time, but future success is built from these foundations. We also strongly sense increasing levels of understanding about CLD and why it matters all over the country. Community-led language and intentions are more frequently referenced, with the focus of questions now more on the ‘how to’ than on the ‘what’. Changing mind-sets, systems and practices to do things differently and to work in community-led ways isn’t easy. To help build understanding about the skills, behaviours and capabilities required to do this work well, we’ve crafted a CLD Capability Framework. This framework seeks to name the different kinds of interlinked competencies that support locally-led success. We hope you will find these resources to be a useful foundation for the work that you do. In the part two of the series, we talk about authentic engagement and adaptive leadership. Read it here. This blog series is adapted from a longer paper, jointly written with the Tamarack institute in Canada. Tamarack celebrates its 15 year anniversary this year. The full paper is now available to read here. The webinar will be available to watch on 31st October. Register to receive a recording here.